Today’s post is bought to you by Amoxil Paediatric Drops… well not really, but I am very relieved to report that the Little Sister is finally on the mend! In a testament to what a good night’s sleep can do, I whipped up some Passionfruit Butter yesterday afternoon in my new Thermochef. Yes siree, for the past few weeks I have been the proud owner of a Nature Thermochef. I’m loving experimenting with it. So far I’ve made jam, sauces, dips, pastes, soups, rice, mash, a shepherd’s pie and some pretty mean cocktails! I’ll post my experiments here in the future – with a normal version of the recipe along with a Thermochef version. Place butter, sugar and beaten egg yolks into a double saucepan. Add juice of passionfruit and lemon. Cook over a low heat until thickened, adding more juice if necessary. Cook at 80C, speed 3 for 8 minutes. Beaut. 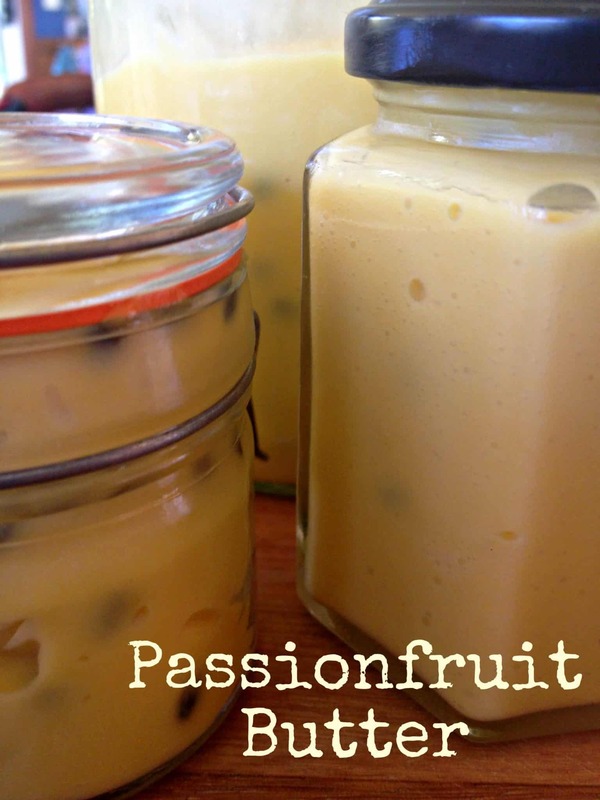 So many recipes I’ve seen for Passionfruit Butter involve sieving the passionfruit to remove the seeds, but I’m not cooking for the CWA and frankly life is too short to sieve passionfruit! It was easy, ready quickly, it’s tasty and very calorific – but as Mum always says “fat is flavour”! Because there were egg whites left-over from the Passionfruit Butter, I thought I’d have a crack at making a pavlova as well. Place sugar in the thermochef bowl, process on turbo speed for 10 seconds. Add the butterfly, egg whites and salt. Cook at 37C, speed 2 for 7 minutes. Spread meringue mixture on a baking paper covered tray. Bake in 100C oven for 60-80 minutes. Turn off oven, open door and allow meringue to cool inside the oven (this should reduce the amount of cracking). Decorate with whipped cream and sliced fruit. Piece of cake! Honestly, pavlova is something I’ve previously had zero success with. All of my efforts today have been flat and chewy. I’d abandoned it to the “for better bakers” category – never to be attempted again. But, I suspect the Thermochef makes this fool proof, because my previous efforts have all been more Eton Mess than Aussie Pav. You could also pipe this mixture into smaller individual pavs or those cute meringue mice if you’re handy with a piping bag. Thank you for such clear instructions and photo. I am going to try my hand at a Thermochef pav today. It was just the recipe I was looking fo. Mine was really stiff when I put it on the tray Leah. Is it possible you over-whipped the egg whites? The first dessert I made when I got my thermochef was choc mousse. I over-whipped the egg whites and they separated. Easy to do: it’s much more powerful than the beaters I was used to. Thank you for your reply Amanda. I really don’t know, I followed the instructions exactly. It didn’t ever go stiff in the 7 mins. I had the temp at 37 for the 7 mins was that right? Yours does look beautiful , did you have the temp at 37 for the whole 7 mins? that is the only other thing I can think of as the machine did feel quite warm and I wonder if it cooked before it whipped. Thank you , I won’t ask anymore, but I would really appreciate your input on the temperature and the time to keep it on. I made mine as per the method, butterfly in, speed 2, 37•C, 7 minutes. I’m confident in the recipe because it has been shared in a couple of Facebook thermochef forums by people who made it with success. I’m sorry it didn’t turn out for you, I know the frustration of a failed creation! Was the bowl clean + completely dry? Egg whites have no trace of yolk?